I feel a bit funny sharing a winter outfit on a 70+ degree day in Napa, but hey, it’s still February and currently below 30 degrees in New York! Before you start hating on me… You should know that I lived in places with crazy (and long) winter months most of my life, so I definitely don’t take being able to enjoy nice California weather for granted. OK, now that we have that covered, I thought some of you might still want to see what pieces I enjoyed wearing the most this winter. Yes, it gets cold in California, too! 😛 Especially, in the valley where the temperatures between night and day drop over 40 degrees sometimes! Even though California winter has been pretty mild this year, I still needed to get some winter pieces for a trip to the mountains we had planned in December. It was my first time visiting Tahoe in the winter and as you can guess, I didn’t even have proper clothes for that weather! Needles to say, if you’re looking for boots with enough stability for your feet, but also super cozy and cute, check out this pair. What was your favorite winter outfit this season? Send me links to your posts! Great winter outfit. Love the colors and layers! I love this coat <3 Mine comes from Zaful too and I was surprised with good quality. It's totally different style though. Gorgeous look dear! Love the cozy and stylish coat, defintiely a great contrast and complement for the burgundy pants. Such a chic look! 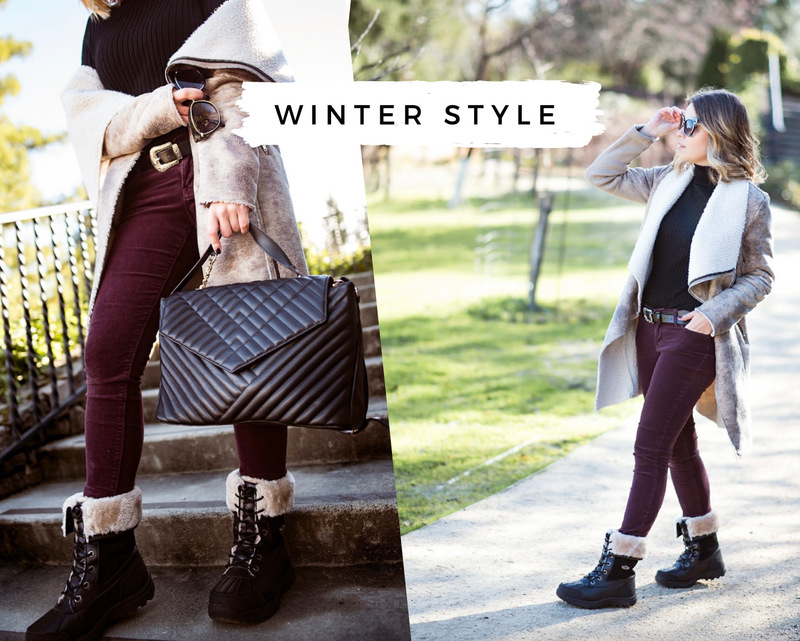 Love your Winter style girl. This outfit is a little edgy, utilitarian, comfortable and put together! Oh those boots are just fabulous and I love the cozy cardi!